It was a clear, cool, blue-sky morning of breathtaking beauty at Ka‘ala Farm and Cultural Learning Center, a green, 97-acre oasis at the top of dry Waianae Valley, where streams were diverted in the 19th century to irrigate plantations of sugar cane. Starting in 1978, under the leadership of the nonprofit’s executive director, Eric Enos, some of the water flow has been redirected back to Ka‘ala Valley, where ancient kalo loi and auwai (terraced fields and irrigation ditches for growing taro) are being restored and cultivated in the traditional Hawaiian way. Nanakuli High students work on Ka‘ala Farm as part of a Department of Education program A‘ali‘i, which lets them earn enough credits to graduate. “The kids struggle with attendance, behavioral issues or just their family life,” said teacher Jewelynn Kirkland. Above, students had come in from planting kalo in November. Before eating, everyone joined hands and said a pule. “Where we are (the farm, as well as an adjacent 1,100 acres of former Ka‘ala Ranch, both leased by the nonprofit from the state) is the best preserved agricultural village system, with three major heiau and the loi still intact, because it was never bulldozed for sugar — too rocky,” Enos said as he and Jewelynn Kirkland, a teacher at Nanakuli High & Intermediate School, supervised 13 students planting dryland kalo. Against the backdrop of the stark cliffs of the Waianae Range and the sea shining far below at the valley mouth, it could have been a scene from ancient Hawaii, except for the young peoples’ T-shirts, slippers, jeans and shorts. Nanakuli High students Christian Garcia, Darius Agor and Robert Baltazar prepared and pounded kalo that was grown on the farm. 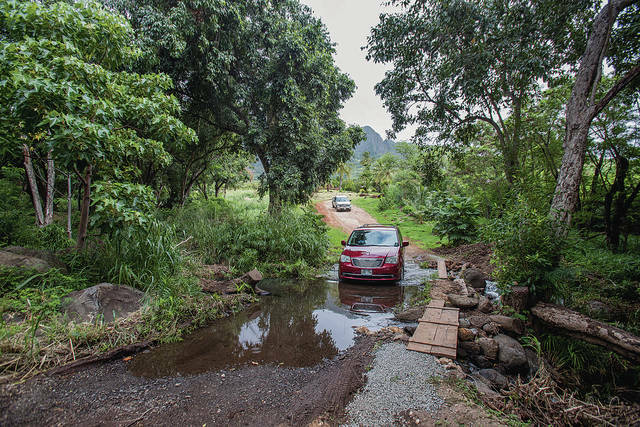 “When we put water into the loi and the native forest, they return the water back into the stream as in the old Hawaiian system,” Enos said, referring to three pipes the farm has laid at the kane­wai, the headwaters of the valley streams, 1-1/2 miles uphill. In 1978, he and fellow Ka‘ala Farm co-founders laid the first pipe to a rivulet seeping out of an old sugar cane flume in what’s become celebrated as “bringing down the water” in local lore. To get to the farm, the staff drive their vehicles through a slow-moving stream of irrigation water. Eric Enos said during heavy rains, the roads wash out. He and his small staff maintain everything themselves, including rebuilding the dirt road twice in November. 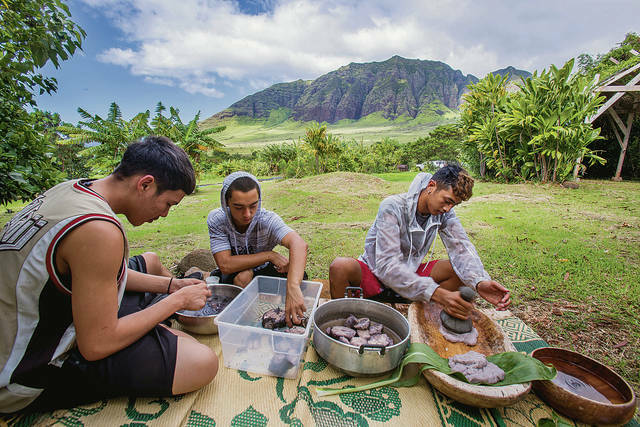 Students from Nanakuli High School work in kalo fields, cook with ulu and and other foods from the land and do other hands-on learning tasks at Ka‘ala Farm in Waianae Valley under the supervision of Eric Enos, the executive director of the nonprofit, and his staff. Enos slices up ulu (breadfruit) that he cooked in a fire pit. 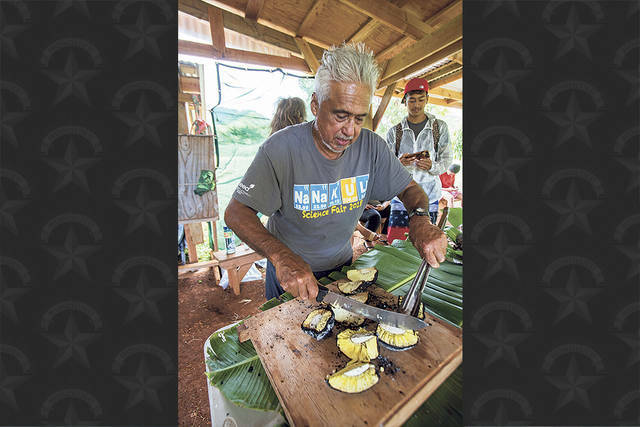 Eric Enos slices up ulu (breadfruit) that he cooked in a fire pit. They did it without permission, because the state Board of Water Supply was using the cane system to supply water to the public, Waianae Sugar Plantation having shut down more than 20 years before. Previously, Enos’ application for a conservation district use permit to divert a portion of the water had been denied. So a few months later, as the pipe was irrigating restored loi and the Ka‘ala group was planting kalo, assisted by taro farmers from Waiahole-Waikane on the Windward side, they were cited for illegal diversion of water. “We were long-haired!” Enos, 71, recalled with a laugh. “We were challenging authority, never mind (it was for) a cultural tradition.” So he was moved to learn that, in a resolution being sponsored by state Sen. Maile Shimabukuro, he and his longtime partners will be honored by the state Legislature this session for the environmental, agricultural and educational benefits that have flowed from his act 41 years ago. And there’s more. On Jan. 10, Lt. Gov. Josh Green visited Ka‘ala and announced he was exploring the possibility of siting a community for the homeless on 20 acres of Ka‘ala Ranch. As of this writing, talks were in progress with Enos about a partnership and infrastructure requirements. AS A young Honolulu native in the mid-’70s, “I had no idea where kalo came from or how it was grown,” Enos said with a laugh. After earning a bachelor’s degree in fine arts and a teaching certificate from the University of ­Hawaii at Manoa (his paintings and those of his son, Solomon Enos, are in several museum collections), he came to Waianae to work with troubled youth in the Rap Center, a nonprofit community organization. There he drew a connection between the poverty and ill health of area residents and the state of their barren, neglected land. That’s why he knew he had to bring down the water despite the denial of his application, which had been approved by all the stakeholder agencies, he said, before the final department said no. “It was a political decision,” he explained. “It would set (an unwanted) precedent if a community group got water put back into streams.” At the time, he explained, water was seen as a commercial commodity and the Board of Water Supply’s mandate was to provide domestic water, not preserve native forests. Now, with the state’s commitment to protect forests as part of watersheds, things have changed. BUT life on the farm remains a hardscrabble existence. Enos and his small staff maintain everything themselves, including rebuilding the dirt road twice in November when it became impassable in the rains. Funding depends on grants that must be applied for annually. And people still dump trash, toxic waste and old cars in the valley. In the dry conditions of early August, Ka‘ala staff and volunteers joined city firefighters in putting out wildfires set by vandals, a recurring problem. In 2015, flames from an accidental Navy fire destroyed Ka‘ala’s hale, a large meeting pavilion. The hale was rebuilt and improved: solid and airy, with a raised floor and pillars made from invasive mangrove trees and a thatched roof of loulu palm fronds. 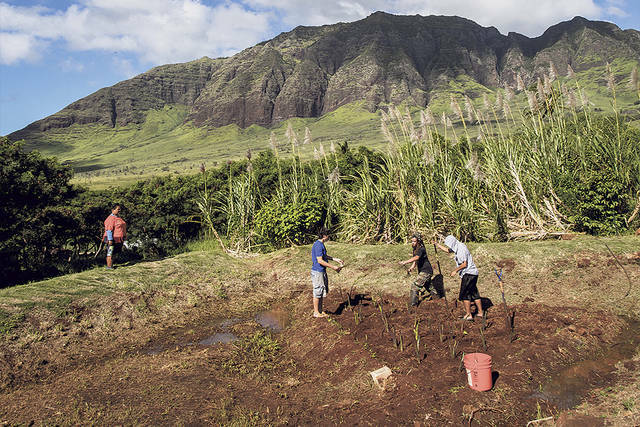 Progress has been made on restoring native forests with the Wai‘anae Mountains Watershed Partnership, and the farm hosts about 3,000 students in sustainability learning visits a year. The Nanakuli students planting dryland kalo were in their senior year but had failed classes and lacked enough credits to graduate on time. To get them caught up, they were enrolled in an integrative curriculum developed by their co-teachers, Kirkland and Katie Fisher, in a state Department of Education program named A‘ali‘i after a resilient, adaptive native plant. “The kids struggle with attendance, behavioral issues or just their family life,” Kirkland said. Many of the students in A‘ali‘i classes, she said, are from broken homes; several have missed school to babysit siblings; three dropped out for two to three years. Some students have been homeless. Still, Kirkland said, the first two classes graduated on time, and she and Fisher are working to ensure this class follows suit. At the farm, she said, they are far from the distractions of their daily lives and “They see how everything is interconnected.” Whether they need credits in history, social studies, science or math, “everything is incorporated” in their projects, from cleaning out old loi to planting, tending crops, regulating water flow and cooking. 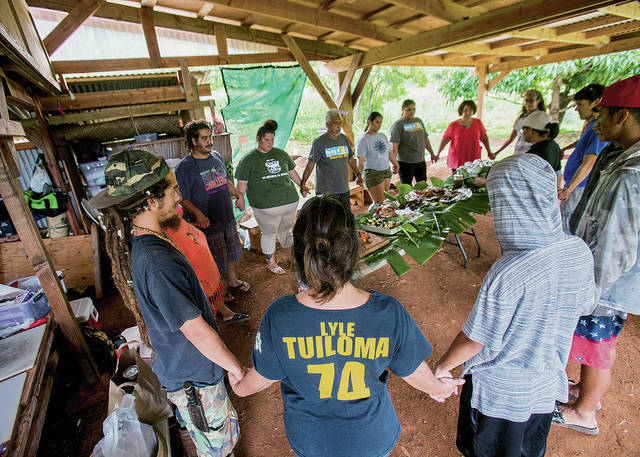 Ka‘ala is growing community leaders, Enos added with pride: In the past two years, for instance, A‘ali‘i students helped lay an irrigation pipe and calculated how much more water needs to be restored to the streams to support a healthy ahupuaa ecosystem. The students helped write a resolution seeking the restoration of water to all the district’s valley streams and helped present it, with Ka‘ala staff, to the Waianae Neighborhood Board, the farmers’ union and Hawaiian civic clubs. Next steps, said Ka‘ala staffer Kellen Smith, include appealing to the Board of Water Supply. “They could let more of the water flow down the way it used to, to recharge soil and plants and be used by the community,” Smith said. Enos also is using some of the students’ research in an application for a state grant-in-aid to fund fire-prevention measures, including bringing down more water. IN THE SHADE of the trees and the roof of the open-air kitchen and dining space, the A‘ali‘i students had come in from planting and were busy making lunch. Baltazar and Christian Garcia were eating freshly picked lilikoi, skins and all. It wasn’t sour, they said. A discussion of processed food with added sugars ensued as students put farm-grown sugar cane through a press and sampled it. “Without sugar, a lot of us wouldn’t be here,” observed Enos, noting that he is descended both from Native Hawaiians and immigrants who came to the islands as plantation laborers. Asked what he was looking forward to doing this year as he filled flatbread with banana, making empanadas, “More stuff like this,” Keahe Soares said. Salausa, Potoae Alapeti and Cherokee Rose Royal-Jenks had returned to Ka‘ala as seniors after studying there the previous year. “We had our own wetland loi, where we were planting and harvesting kalo,” Alapeti said. They ended up as kalua pig, Royal-Jenks said. Everyone paused to sample Smith’s new recipe: pickled starfruit made with pressed cane juice. Because these students were so interested in food, Kirkland said, the curriculum this year includes making preserves. The fish were ready. The empanadas and paiai were done. Everyone stood around the table, holding hands, and sang a song of thanks before sharing a makahiki meal. THE tree-shaded, dirt parking area at the bottom of the farm lies in a native dryland forest that Ka‘ala volunteers have been restoring as a nature preserve, acquired with the help of the Trust for Public Land. In the quiet one could hear the running waters of Honua Stream. “Isn’t that a nice sound?” Enos asked with a smile.